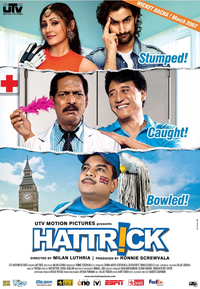 Review Summary: HATTRICK is an average product at best. At the box-office it won't score a century nor will it be clean bowled at the start. Till the ‘multiplex culture’ came to India, a majority of Hindi movies packed multiple stories in those three hours. A bit more of fun and games (cricket of course) and the film might just have been that googly at the cash-starved box office. HATTRICK is an average product at best. At the box-office it won't score a century nor will it be clean bowled at the start. The World Cup fever is on the rise. Cricket is in season. Nana Patekar is in full form an emotionally strong second half good music and the length of the movie is just about 2 hours.